SYDNEY, Australia―Multi-award winning film documentary “Hard To Believe”―an expose of organ pillaging from prisoners of conscience in China has wrapped up its premiere tour across Australia and New Zealand. Attending audiences participated in Q&A sessions with a panel of subject-matter experts following the screenings. Directed by two-time Emmy winning Ken Stone, “Hard To Believe” questions why the international community has not been paying attention to this grisly practice in the world’s second largest economy. The film screenings and expert panel events have attracted the support of the Australian Lawyers for Human Rights, the Australian Council for Human Rights and Education, and the International Coalition to End Organ Pillaging in China. Introducing the film in Sydney, former Australian Lawyers for Human Rights president Nathan Kennedy told the audience that observers can no longer sit dumbfounded in disbelief at what is happening in China. “We cannot let this grotesque assault on human dignity go unchallenged and we have no excuse to turn a blind eye to do nothing,” he said. The screenings come on the heels of House Resolution 343 which on June 13 saw the US House of Representatives voice its concern about “persistent and credible reports of systematic, state-sanctioned organ harvesting from non-consenting prisoners of conscience,” in China. 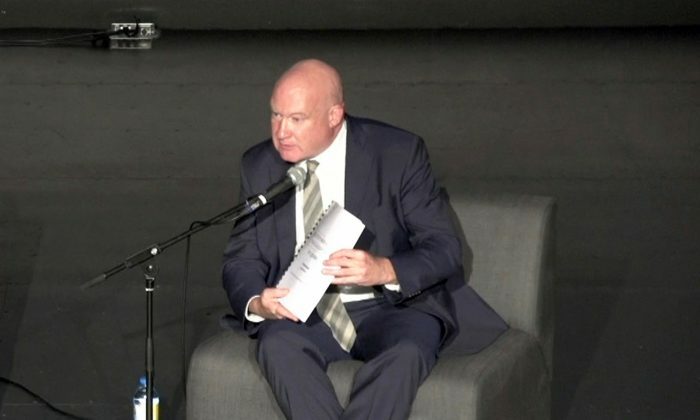 Investigative reporter and China analyst Ethan Gutmann―part of the expert panel touring Australia is co-author of an updated, comprehensive report on China’s organ transplantation industry―”Bloody Harvest / The Slaughter: An Update.” Fellow authors David Kilgour, former Canadian Secretary of State for Asia-Pacific, and Canadian human rights attorney David Matas, on June 22 launched the report, which details the use of prisoners of conscience as a profitable organ source. Gutmann after the Sydney screening at NSW Parliament House on Aug. 5 said the updated report focused on the transplant programs of 146 of China’s authorised transplant centres. The 700+ page dossier by Matas, Kilgour, and Gutmann brings together a hospital-by-hospital examination of bed numbers, utilisation rates, surgical staff, training programs, new infrastructure, recipient waiting times, advertised transplant numbers, use of anti-rejection drugs and with information collected from media reports, medical journals, hospital websites and archived websites. “The confidence that is expressed in a future where sourcing is seemingly limitless is one of the most striking features of the report,” said Gutmann. Despite China assuring the world for over a decade it would move towards an ethically sound organ donation system and that by 2015 it would cease sourcing organs from executed prisoners, no evidence has been offered and hospitals remain closed to independent verifiers. China’s organ donation system in 2015 yielded 2766 voluntary donations leading to 10,057 performed transplants. The gaping discrepancy between these numbers and those presented in the Matas, Kilgour, Gutmann report and evidence that the main source of organs are prisoners of conscience are simply not being addressed. China’s Communist Party mouthpiece Xinhua reported on Aug 18 that Dr. Huang Jiefu, the head of China’s Organ Transplantation Committee and leading Australian-trained transplant expert said that reports of 60,000 to 100,000 transplants using organs from prisoners of conscience were “lies spread for political purposes”. Huang continues to be a controversial figure. Trained by the University of Sydney and awarded by it with consecutive honorary professorships, he’s performed hundreds of transplants personally and admitted that he does not know the source of the organs. In an interview with Phoenix Television in 2015 he explained that sources of organs in China are unknown and “the transplant numbers are also secrets”. “What we’ve been told about China reforming is not true, it’s a lie, China is not reforming,” said Gutmann. Dr. Francis L. Delmonico, former president of The Transplantation Society―the leading body of international experts in organ transplantation, in his sworn testimony at a congressional hearing alongside Matas and Gutmann on June 23 intimated that the TTS have no way of verifying China’s claims of supposed reform. He noted several times that he had no insight into the military hospitals where most of the forced organ harvesting takes place. Chinese doctors involved in the transplant industry nevertheless featured prominently in TTS’s annual conference in Hong Kong between Aug. 18 and 23. According to David Matas, many of those presentations remained highly suspect in terms of organ sourcing. Screening panelist Maria Fiatarone Singh, geriatrician at Sydney University and member of Doctors Against Forced Organ Harvesting—a network of doctors and surgeons wanting to stop the practices of illegal organ harvesting―told the audience that the TTS is a part of the problem. “The leadership of the transplantation surgeons in the West have been very, very forgiving towards China, they have been very, very lenient in their ability to criticise them for what they are doing, and they should be calling them murderers, they should not be calling them friends and colleagues, which is what they have been doing,” she said. DAFOH too in a recent statement called on the TTS to investigate the allegations, the “mass of critical evidence” of forced organ harvesting in China, particularly in light of the US resolution and a similar declaration made by the European Parliament earlier this year. “The medical community has the lion’s share of control of this issue―it’s the most important front to advance on,” said Gutmann. “Call your doctor and tell him or her to speak up because we are complicit in many ways, we’re complicit because we trained Huang Jiefu here at the University of Sydney to be a liver surgeon, we gave him the skills to take back and start up this entire industry, so we are at fault,” said Dr. Singh.